In 1909 a group of San Diego's leading citizens conceived an idea to celebrate the opening of the Panama Canal by holding an exposition. After several months of planning and raising funds, an area in the southern portion of City Park was selected as the site for the 1915 Panama-California Exposition. The architectural style of the buildings was to be based on the California Missions, and the grounds laid-out with plazas, gardens, and arcaded walkways. However, by 1911 it was decided that the site selected, just north of San Diego High School, would be inadequate for the exposition, and that a larger area would be required. At this time Bertram Grosvenor Goodhue was hired as Consulting and Advisory Architect for the project, and Frank P. Allen, Jr. as Director of Works. Together the two men selected a more central site in the recently re-named Balboa Park, and the architectural style was changed from California Mission to Spanish-Colonial. 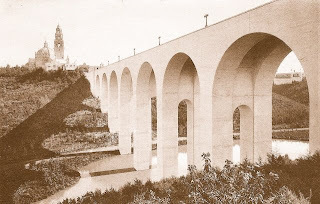 The new site was not as readily accessible, due to a canyon located on the west side of the park, so a large permanent seven-arched concrete bridge, named the Puente Cabrillo, was designed to provide a grand entrance to the complex of exposition buildings. 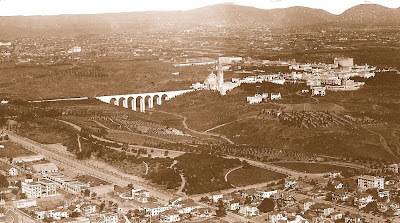 A central avenue, on a line with the bridge, served as the main thoroughfare and was named El Prado. 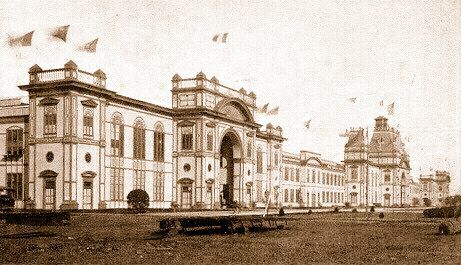 Along El Prado were placed the principal exhibition structures, consisting of the permanent concrete California State Building and Fine Arts Building, the Administration Building, Science and Education Building, Indian Arts Building, Sacramento Valley Counties Building, Home Economy Building, Foreign and Domestic Arts Building, Botanical Building, Commerce and Industries Building, Varied Industries & Food Products Building, and Southern California Counties Building. 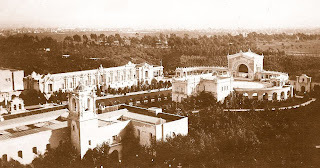 The lushly landscaped grounds were laid-out by Mr. Allen; and assistant-architect Carleton Monroe Winslow designed the majority of the exposition buildings, most of which temporary wood and stucco exhibition structures. As completed, the exposition represented a miniature Spanish-Colonial city, with the buildings designed in various styles found throughout Mexico. Baroque, Churrigueresque, and Plateresque styles were intermixed with Moorish, Mission, and Italian elements. 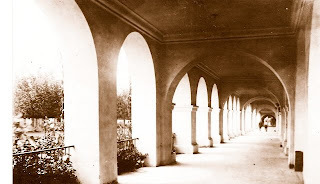 Connecting the various buildings on El Prado were long arcades, providing a consistency along the avenue and a smooth transition from one building to another. Three main plazas were located along El Prado, and consisted of the Plaza de California at the avenue's west end, the Plaza de Balboa at the east end, and the large Plaza de Panama placed at the center. South of the Plaza de Panama, and connected to it by a long esplanade, was the Plaza de los Estados upon which was located the Spreckels Organ Pavilion, Salt Lake Route and Union Pacific Building, San Joaquin Valley Counties Building, Kern and Tulare Counties Building, and the Alameda and Santa Clara Counties Building. South-west of the Plaza de los Estados were the state buildings of Kansas, Utah, Washington, Montana, and New Mexico. In the area north of El Prado was placed the amusement area, known as the Isthmus, containing numerous rides and attractions. West of the Isthmus was an avenue named the Alameda, along which were located agricultural displays, consisting of a Southern California model farm and model citrus grove, the International Harvester Company Building and tractor demonstration field, and the Lipton tea plantation; as well as the Standard Oil Building, and the Nevada State Building. Three entrances provided access to the grounds: the West Gate, located at the west end of the Cabrillo Bridge; the East Gate, located on the Plaza de Balboa; and the North Gate, located at the north end of the Isthmus. The exposition opened to the public at midnight, January 1st, 1915 amidst a citywide celebration. Although originally planned to close on December 31st, 1915, the exposition continued until December 31st, 1916, remaining open a full two years. 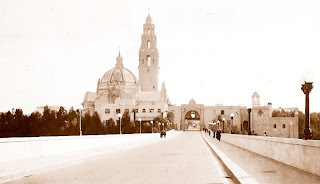 Despite Mr. Goodhue's objections, many of the temporary structures remained standing after the exposition closed, and soon became cherished as architectural masterpieces by the citizens of San Diego.